TOLEDO, Ohio, December 13, 2010 (ENS) – Federal and Ohio state agencies, the City of Toledo and a consortium of corporations jointly announced today that they have finished removal of contamined sediment from the Ottawa River that runs through Toledo. The cleanup involved dredging 242,000 cubic yards of contaminated sediment from a 5.5 mile section of the river. The U.S. Environmental Protection Agency provided $23.5 million for the project through the Great Lakes Legacy Act, a federal program targeted at cleaning up contaminated sediment in Great Lakes Areas of Concern. Another $23.5 million was provided by the Ottawa River Group, a consortium of private businesses in partnership with the City of Toledo, including Allied Waste North America Inc., E.I. du Pont de Nemours and Co., GenCorp Inc., Honeywell Inc., Illinois Tool Works Inc., United Technologies Corp., Varta Microbattery Inc., The Mosaic Co., Perstorp Polyols Inc. and Grand Trunk Western Railroad. The City of Toledo provided space in the municipal landfill as its cost share. “This cleanup brings us closer to the day when it is safe to swim in the Ottawa River and all its fish are safe to eat,” said Cameron Davis, senior advisor to EPA Administrator Lisa Jackson. “Previous Great Lakes Legacy Act cleanups have improved local economies as well as the environment and this is an important step forward for the region in efforts to restore the Great Lakes,” Davis said. Arising in southeast Michigan, the Ottawa River flows for 15 miles through northwest Ohio. It drains an area on the Ohio-Michigan border along the eastern and northern fringes of the city of Toledo and flows into Lake Erie’s Maumee Bay. The contaminated sediment resulted from runoff and discharge from industrial sites, landfills and sewers and from the river’s form and structure, since it has a slow flow. More than 7,500 pounds of polychlorinated biphenyls, or PCBs, 80,000 pounds of and polycyclic aromatic hydrocarbons called PAHs and more than a million pounds of heavy metals were removed from the river during the dredging cleanup operation. This sediment contamination was a key contributor to the “do not eat” fish advisory and the “no contact” water advisory that are currently in place for the Ottawa River. 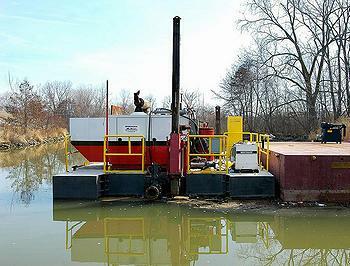 On May 1, crews began to remove the sediment using hydraulic cutterhead dredges. These large suction systems pulled in the sediment and river water and pumped them to the Hoffman Road Landfill for processing and disposal. The water was collected and treated to meet discharge standards before it was returned to the river. About 15,700 cubic yards of sediment with the highest concentrations of PCBs were treated separately and sent to a landfill in Michigan that is licensed to accept this type of waste. The completion of this project marks further progress in the cleanup of the Maumee River Area of Concern, a key priority under the Great Lakes Restoration Initiative.